I have your first teapot book. My mom collected teapots so of course I made her a small quilt with your designs. This was long before I found your blog. She passed away two years ago and the quilt has returned back to me. Ironically I collect teapots and cups now! Definitely know what it is like to have a birthday close to Christmas, mine is on Christmas Eve! Thanks for the great giveaway! I collect teapots so this would be the perfect thing to enhance my collection shelf! Thanks for the opportunity! I too have a birthday close to Christmas. In fact it is the 21st which is coming up this Saturday! I love your teapots! I used to collect them and them my children were born and I collect toys, and shoes and hugs so the teapot collection went to the wayside. Thanks for the inspiration! I love the floral used in the teapot pictured. What is it about teapots that we all love? I remember a collection of them on my mother’s hutch, and I have some of the teapots now. I’d enjoy appliqueing the patterns in your pretty book. Thanks! I love your teapot patterns. Thanks for the great giveaway and have a happy birthday! Oh Kay what an amazing and generous thing to do. I love your applique patterns and would love to have a copy of your book. Thank you, thank you, thank you. I’m a constant tea drinker so I love seeing the different teapots and cups. Lovely book and fun giveaway! Hope you have a wonderful day and year! Happy Birthday, love yhe teapot designs. Happy Birthday Kay! I am growing to love teapots as well and am truly interested in the back basting lesson. Thanks for the reverse Birthday gift and have a great day! My mom collects teapots, she would love a quilt made from these. And I think it super cute and would NEED one also! Happy Birthday, thanks for the fun! I have collected tea pots and cups since I was a little kid……..60 plus years now. I would love the book to make a new teapot quilt. Here is another December baby! I am the 13th. I would love the teapot book! I love all your patterns and I don’t have the teapots. Merry Christmas! I would love to win your book. Applique is on my bucket list for 2014! Happy Birthday! Happy Birthday! I love teapots! Thanks for the chance to win this wonderful book. I would love to make a quilt or wall hanging from your teapot book. I am so excited to be part of this wonderful giveaway – Thanks so much – I just love teapots and of course, tea!! I love your teapot designs and I love applique. Great combination! My best friend and I collect all things tea and often go out for high tea together. I’d love to make her a quilt using your tea designs! She also has a Dec. 28 birthday. We always celebrate it totally separately from Christmas. Thanks for offering this as a prize. A very Happy Birthday to you. I would love to win. I love drinking tea and collect teapots. Would loveeeeee to win your teapot book! you should see my kitchen I have tea pots going all around the entire thing and still have tea pots besides that are packed away because they would not fit! Happy birthday! I would love to win you book on teapots, I have a aunt that would love a quilt with teapots. Kay love your books. Have a Merry Christmas and a Happy New Years. Thanks for a chance to win one of your great books! What a wonderful opportunity – would love to win! I love tea parties and it would be fun to incorporate a tea themed quilt in my next tea party. Thanks for the opportunity to win. Happy, happy Birthday Kay. It’s always a delight to see you at quilt shows. Hoping you’ll be at Road next month! What a lovely way to celebrate your birthday. Fingers crossed!!! Happy Birthday, my daughter’s is the 14th, my niece the 25th. I love teapots so I will have to get this book no matter what. What a great idea, I too have sevearl tea pots and so thank you for this giveaway. I love the designs in this book. Fingers crossed! I hear you! Combo presents were sucky when I was little. :( Happy Birthday!! Oh, I hope you draw my name. I love your blog and your books and would love to have this book. Thank you for the chance to win. What a great prize you are offering. I love teapots and would love to win this prize. I have always loved your teapots! Such a charming book! Hope I’m one of your winners! My MIL collected teapots, cups & saucers. I inherited her collection and they are displaying beautifully in my dining room. That picture is beautiful. And the question was raised, what do we love about tea pots? I think like a favorite soup – they remind us of love, warmth and comfort. My birthday is right after Christmas–everyone has holiday fatigue, so you have my condolences. The book looks charming; thanks for the chance. Oh, teapots are so pretty! These are so pretty! I have a fabric that would be perfect for a teapot block, too. I love teapots too! What could be more relaxing than hand applique and a cup of tea. My birthday is January 8th, so I completely understand the whole gift thing. I love tea, teapots and applique, so this giveaway is perfect! Thank you so much for doing it, and a very Happy Birthday! I love this teapot book. I’ve eyed it longingly ever since I first saw it. Thank you so much for your generous giveaway and the chance to win. I have always felt a bit sad for those with Christmas birthdays. You may not get combo gifts but you only get gifts once a year! Applique is one of my favourite techniques to use in stitching. It is so much fun building a picture. Thank you for sharing this giveaway. Happy Birthday to you! Happy Birthday! My birthday is on the 20th and my childhood was filled with disappointment over the “I got you one large present so it would be for Christmas and your birthday” scam. My cousins are about the same age and got presents of similar value for Christmas, but they also got real birthday presents. Luckily, I dealt with the disappointment and didn’t turn into an ax murderer. I do love tea and collect teapots. It would be lovely to receive a copy of your book. I would count it as a Christmas present too. Thanks for the generous giveaway. Having lived in England for two years, tea and teapots have a special place in my heart. I would love to have this book. Thanks so much for all you do. Happy Holidays. Wishing you the happiest of birthdays! My mothers birthday was Dec 21st and we always made sure we had a party and kept it separate from the holidays. Love your books and would enjoy the teapot book. May you have a very Merry Christmas. Happy Birthday to you! My MIL and daughter love teapots – what a lovely thought to do a giveaway and share ! thank you! What fun..please count me in the drawing. My twins have December birthdays, and now my son-in-law and a future son-in-law all have December birthdays! From a mid December birthday gal,Happy Birthday, Kay! Know just what you mean. The book is great. Thanks for the chance. Happy Birthday Kay, I have a son born in early Dec. When he was little, we always waited to put the Christmas decorations out until after his birthday so that he didnt feel his birthday was lumped in with the holiday. Happy Birthday to you and thank you for the opportunity to win this book. Both my children’s birthdays are around Christmas, December 21st for my daughter and December 26th for my son. Merry Christmas!! Love that teapot, the fabric is beautiful. I love the look of teapots! So elegant! Happy Birthday Kay. Love your applique designs and would love to win this book. Thanks for the chance to win. What a tea-lightful gift! I hope you have a wonderful birthday! It would be a treasure to make a teapot quilt. I love applique–but haven’t tried the back-basting technique…something to add onto my 2014 learn-to-do list! It`s true – we do love our teapots! 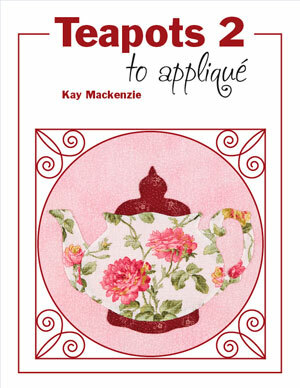 Kay, your teapot appliqué book sounds very appealing. In the new year, my resolution is to get more appliqués done in my life. I would be honored to have this book of yours. I too always felt hyped because my bday is close to Christmas. Yep the gift never seemed bigger than the others around the tree. Merry Christmas and a great 2014 year filled with health, love and creativity. I, too, have a “close to Christmas” birthday on 12/29. I feel your pain. What a great contest. I love, love, love teapots, tea and quilting. Have a joyous Holiday and a prosperous and safe New Year. Many kindred spirits out there as I,also, love teapots and applique. I would love to win your book – thanks for the opportunity. HAPPY BIRTHDAY! Happy Birthday, Kay! I’m feeling guilty because I just gave a combo gift to my son-in-law, whose birthday was December 10. Happy Birthday! Please pick me! My daughter needs a teapot quilt! Happy birthday! Teapot patterns are great; there are so many things you can do with them. A teapot quilt would be so much fun! Please add me to the drawing. Happy Birthday Kay! I don’t know if I made it in time to enter into the give-away but a girl can try! Thanks for the chance. Just got your e-mail and I responded. Thank you sooooo much. Merry Christmas. crystalbluern at onlineok dot com.